One of the guys on the COSMAC ELF mailing list, Bill Rowe, asked the people on the list if they would be interested in purchasing a run of boards for my serial port adapter. Right after I read that on the mailing list, I saw a message from Bill in my inbox asking me if I’d be interested in working with him to make a printed circuit board for the project and sell it to people who are interested. I was OK with the idea, but with everything that’s going on with Dana I haven’t had a lot of time for other projects. Or at least I didn’t think that I did. I sent the schematic and board files to Bill so that he could make a first pass on them – once he sent them back I started playing with the board files until I had something that I could send off to Osh Park to have fabbed. Waiting the two weeks that it takes to get the boards back isn’t fun, but it beats waiting months – or not making the project at all because you don’t have a board. Anyway, the boards came back from Osh Park, the parts that I ordered online came in (along with a whole bunch of other stuff that I didn’t really need but I thought, what the heck, I’m ordering) and I started finding all of the little things that I managed to do wrong. The DB-25 connector needs to be on the solder side of the board, not the component side. Somehow I missed where I crossed two traces. After I corrected those two faults (one with a knife and a bit of wire, the other by putting the LEDs on the solder side) it actually worked the first time when I got the prototype built. I’m pretty proud of the whole thing. Something that I designed and outsourced work on and built myself all works like I intended it to. I’ve already sent out the Rev. B of the board. It will have the DB-25 connector on the other side, and with that change I was able to add a couple of other jumpers to make it easier to put the LED enable and oscillator enable lines under control of the Picaxe. But the first one will always have a special place, ‘cause it was my first. Got my Quick2Wire Raspberry Pi expansion connector and I2C port expander kit today. Came all the way from England, so shipping was almost as much as the kit. My only complaint so far is that the 26-wire expansion cable that plugs into the Pi at one end and the expansion connector on the other is only about 2 inches long. Another inch and it would easily reach the desktop when the Pi is in its case. I haven’t started on the assembly yet, but it looks to be a straight-forward and easy build. Hopefully I’ll remember to take pictures as I work. “Bee Dee” on the Yahoo COSMAC ELF group suggested that we document the progress of our various ELF2K and Membership Card projects with photos and videos to share on the Web. I’m not so much with video, but I can take a picture or two and write up what I’m doing. I’ve been working on improving the serial port adapter that I build using a Picaxe 20X2. I showed the new version to the group on the mailing list, and suddenly I had a new idea to work on. 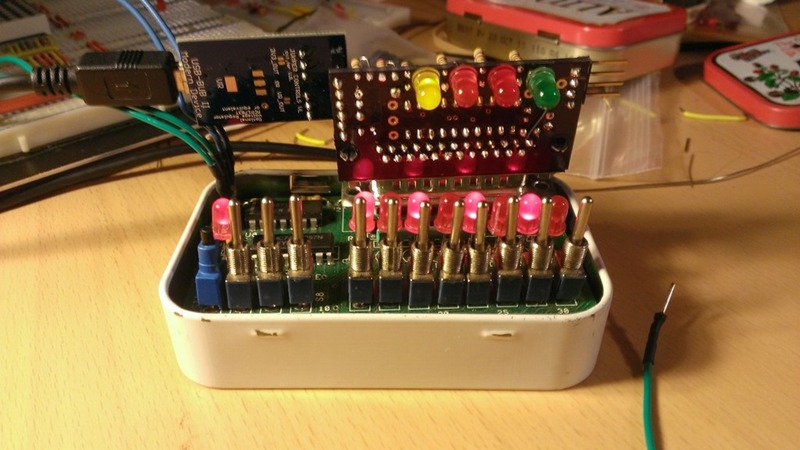 I was inspired by a posting on the mailing list by Lee Hart – replacing the stock front panel of the Membership Card with a new keypad and LED digit display controlled by a Picaxe microprocessor. It sounded like a good idea to me, that is if I could get everything to fit on the small footprint offered by the Membership Card. Figure out if I can get a Picaxe 40X2, a 16-key keypad, and two LED displays on a board the size of the Membership Card. Come up with a tentative assignment for the input/output ports on the Picaxe. 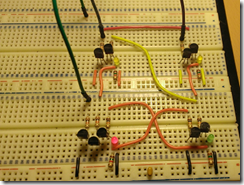 Build a version of the circuit on a breadboard to make sure that it works. Write software to make the whole package work. Layout a PC board and get it manufactured. Build a prototype and see if I got it right. Hopefully I’ll keep engaged on this project until I get it done. Making a commitment to writing it up should help with that. One of the members of the Yahoo COSMAC ELF mailing list bought a Dage Scientific MC-3 on eBay. 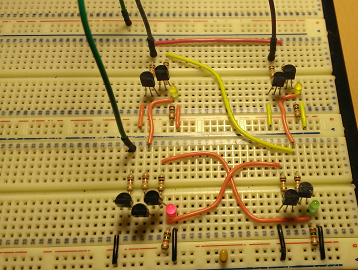 He wanted to know more about it, so I wrote up an article so that there is some information out there on the Web about this 1802-based microprocessor development system. The article is here: Dage MC-3.